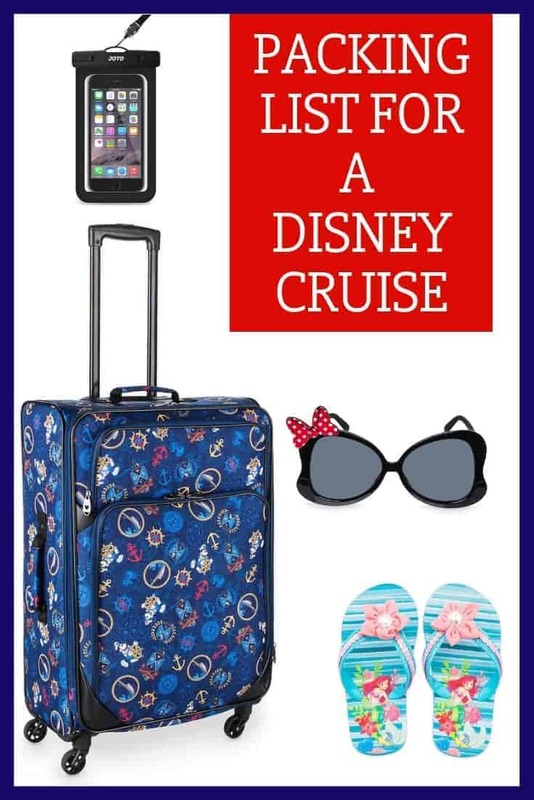 If you are preparing for a Disney Cruise, you probably are making a list off the things you will need to bring. While there are certain things you will be able to buy on board, there are certain items you are better off packing in your luggage. Wondering what to bring for your Disney Cruise vacation? We have compiled a great Disney Cruise packing list that you will want to read before you leave! 1. Sunscreen & Sunglasses. While you can purchase sunscreen & sunglasses on board the cruise ship, you will pay more than you would had you brought it ( and the choices are limited). 2. Sand Toys/ Inner tube/ Water Wings. One of the benefits of going on a Disney Cruise is going to their private island, Castaway Cay! You can purchase sand toys and inner tubes there, but if you have your own bucket, shovel & sand toys, you might as well bring them to avoid the extra charges of renting or buying these kinds of things. 3. Pirate Outfit. All Disney Cruises have a Pirate Night when all Cast Members, Crew, and Guests are dressed in their finest Pirate attire. They will give you bandannas to wear, but why not go the extra step and pack a pirate outfit, sword or eye patch to take with you! 4. Sweater or Jacket. Yes, you are most likely planning a cruise during warm weather, but in the evenings the wind may pick up or you may find that the restaurants are a little cool. Having a cardigan sweater or lightweight jacket to throw on (especially for little ones) is great to have just in case. 5. Flip flops. You can walk around barefoot on the Disney Cruise line pool deck, but it can get quite slippery. Be sure to pack flip flops or water shoes to wear poolside and while on the beach in Castaway Cay. 6. Detergent. There are laundry facilities on the cruise ships for you to use. Not that anyone wants to do laundry, but it is nice if you have a few Tide pods or individual load Tide packs packed just in case you need them. 7.Snacks. 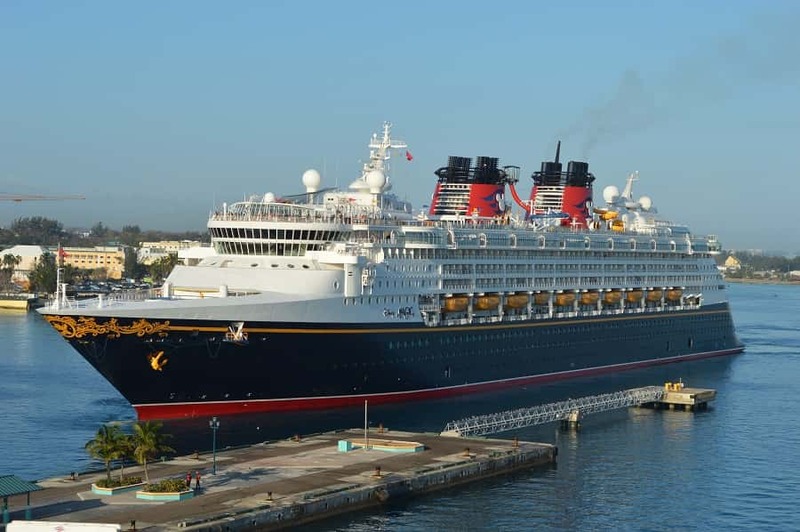 You can bring bottled water & snacks on board the Disney cruise ship to keep in your cabin. This way you will have something to take with you on your excursions or just to have in your state room. 8. Beach bag/ Backpack. Whether you go to the beach at Castaway Cay or take an excursion, you will want to have a light weight bag with plenty of pockets to carry off board with you. 9. Garbage/ Ziploc bags. We always keep a garbage bag for dirty clothes. Since we aren’t going to be doing laundry while on board the Disney Cruise, it helps to keep all used clothing in one place. Ziploc bags are great for anything including wet suits that don’t dry in time on your departure day! 10. Cruise documents, excursion information, maps, birth certificates and other important ids! The most important items on your Disney Cruise packing list are your cruise documents! I suggest putting all documents in a document bag so you don’t end up losing anything during your check in process! 11. Waterproof case. A Waterproof case to hold phone, key cards, money, ID is great to have at the pool and when you go on excursions. 12.Soft Soap pump for washing hands. Yes, there will be bar soap, but there is something icky about bar soap after you use the restroom. A soap pump is perfect for a cruise. 13. Motion Sickness prevention device/ medication. Even if you don’t normally get sick, you should be prepared for motion sickness anytime you cruise. 14. Beach Towel Clips. These towel clips keep your towels attached to your chair when it’s windy & is great for putting things to dry on balcony chairs. 15.Binoculars. You don’t have to buy fancy ones, small inexpensive binoculars will do. These are great for sitting on your balcony or checking out Castaway Cay and other destinations you might go to. 16.Collapsible Laundry Hamper. These are great to give you a place to put all those dirty clothes. I love this collapsible hamper because you can just throw it into your suitcase at the end of your trip! 17. Downy Wrinkle Release Spray. While there are irons in the laundry room, when it comes time for dinner, it is hard to get your hands on it! Bring a small bottle of Downy Wrinkle release to spray your clothes. It will release those creases in no time! 18. Small Lysol bottle. While rooms are clean, you know that they don’t properly disinfect things like the wave phones, door handles, and remotes. I always bring a small travel bottle of Lysol when I travel for this very reason. 19. USB hub. Disney Cruise ships never have enough places to charge your devices. If you bring one of these hubs, you one plug will turn into several USB ports so you can charge your phones. Am I missing anything? If you have something to add to our Disney Cruise packing list, please comment below! Decorations for your cabin door. Thanks! Disney is pretty strict about what you can put on your door. We were going to get one of the hanging attachments, but totally slipped our minds. Thanks for adding this to the list! There is a formal night, but it isn’t as fancy as you might think. But yes, you will want to make sure that you pack a dress. If you plan on getting drinks from the pool deck (sodas, coffee, tea…) it is nice to bring your own cup or travel mug since the cups are so small. I do think you still need to use the little cups to fill your own cup though, I can’t remember. Also, even though you put sunscreen if you are someone who forgets to reapply and burn (like me) it is nice to also have Aloe Vera or another type of sunburn relief. My husband and I got burnt in the middle of the cruise and all the sunburn relief on the ship was already sold out! Yes. I even bring a pump bottle of hand soap. I’m not a big fan on bar soap. No doubt! Hair ties are essential for the pool and castaway cay! Bring at least one night light. It’s pitch black in the rooms at night. My kids wanted them and it made it easier for DH and I to navigate the unfamiliar cabin at night. Bring a watch. There are few clocks on the ship and you’ll want to know when to get ready for dinner. We used an inexpensive athletic watch on the strap of our beach bag. Yes! That is a great tip! It is so hard to find the bathroom in the middle of the night. When we sailed on the Disney Fantasy, they now have a night light switch for the overhead light. Flip it one way and the light is on full power. Flip it the other direction and it creates a very soft glow in the area with the bunk beds. Once we closed the curtain, it was dark on our side but had just enough light in the kid’s area to keep our kiddo comfortable. That is a wonderful feature. The room gets so dark (especially interior rooms) that it’s nice to have a some light for little ones. There never seems to be enough counter space in the bathroom for my toiletries, so I started cruising with a small hanging toiletry bag. It hangs on the towel bar and has enough compartments for me to store everything I need for our voyage. No more wet makeup brushes! We like having a small magnetic dry erase board for messages to others in our party during the day. My kids love to draw and also enjoy decorating it based on events going on around the ship. We bring a over door shoe holder that works great for holding all sorts of things. You can get them at Dollar Store. Love the Dry Erase board idea! Disney no longer allows over the door shoe holders. They damage the doors. We didn’t have any problem in December 2015, but it may depend on your room steward & if they enforce it. We still use the over the door shoe holder but instead of hanging it over the door we use those Magnetic Hooks and hook it to that, then stick it to the wall. We also use the magnetic hooks for hanging up bath suits in the bathrooms. They don’t damage the walls and we’ve never had a problem with them. What a great idea! I need to get some of those before our next cruise! I just read that on their Not Allowed list. They also don’t allow pool toys or floats. The other items are normal. This is true. The pool is way too small for floats! You can bring your own pool & beach toys to Castaway Cay though. Get for the kids and even the adults the bracelets that help with nauseousness and dizziness Fromm the movement rather than the medication you can get them from a dive shop or order online. They work great and they are soft material and can get wet. We also took our own snorkeling for cay for the kids. Yes, we’ve been lucky and haven’t noticed any movement on our cruises, but if you are prone to seasickness those bracelets will be valuable to have. How do you get bottled water onto the ship if you are flying? It was you can take that and alcoholic beverages (only a certain amount) in your carry on, but you can’t carry that onto a plane! We are flying non-stop to Orlando and taking the Disney shuttle bus to the port. Any suggestions? If you are flying in the day/eve before, take a rideshare service from MCO to the nearby Walgreens (Semoran Rd.) and back. There’s a Starbucks and several restaurants in the same area as the Walgreens, too. You would need to pack it in luggage that would be checked in, not carry on. Please do not pack drinks in carry on luggage at the port. They should be carried on. The porters are not very gentle with the luggage and if your bottles of water break, they can make a mess of your things and other people’s things, too. There is no pirate night for Alaska cruises. Keep the pirate costumes home and bring rain gear. Don’t over pack; you may have tea with a princess but you won’t have dinner with the queen of England . We, my husband and I, did the two week cruise on the Wonder through the Panama canal with only a roll on each. Yes, the Mouse is very strict on over the door anything. Use magnetic hooks and clips. Why birth certificates? Also, do they definitely have puddle jumpers to use or buy? I don’t want to fly with those. Thanks! If you have a passport, you won’t need your birth certificate. Complimentary flotation vests are available on the pool decks aboard all Disney ships. You can’t take them off the ship, but they are available at Castaway Cay and on most Disney Excursions involving water/ beach activities.